Flat Panels vs. Projectors on Campus: Where, Why, Which? Just like the diverse student body and teaching staff at today’s colleges and universities, classrooms, lecture halls and other teaching spaces are equipped with a variety of AV gear. The school’s projectors and flat panel displays that are distributed throughout the campus are not there by chance, but because their attributes best fit the teaching situation and setting. Both projectors and flat panel displays create images for groups to look at and often interact with. But, they diverge when it comes to the way they work, where they end up on campus and how much they cost. For instance, a 50-inch display that would work well in a seminar room with a teacher and several students marking up a map of Hanibal’s journeys wouldn’t cut it in an auditorium with 350 freshmen trying to absorb Psychology 101. Here’s where each works well and not so well. Overall, these devices are at their best when filling a screen in a semi-dark room and have the huge advantage of scalability. Unlike flat panels that are of a fixed size, projectors reflect an image off a screen and have the flexibility to create an image that is as big or small as you need. For instance, most classroom projectors can fill anything from a 2- to 25-foot screen. With specialty lenses available, large venue projectors go a step further by being able to create a 50-foot image for a theater’s roll-down screen or even project onto the side of a building for an art project or fund-raiser. Projectors are also often cheaper to get with acquisition costs at about half that of similar flat panel displays. The advantage is balanced by their extra costs, though. For instance, while a 60-inch flat panel might cost $50 a year in electricity to run it for 10 hours a school day, that’s it. With the exception of solid state projectors that have illumination engines built to last the life of the device, overall projector costs can add up quickly. After you factor in replacement lamps, filters and downtime, figure that the typical conventional projector’s operating expenses will run two- or three-times more than a flat panel screen. But, by far the most onerous aspect of projectors is that its beam can be dissipated or obliterated by the sun shining in on a bright day. You might need to close the blinds or suffer with a washed-out image while examining the archeology of Catalhoyuk for an anthropology class. Because a flat panel creates its own image rather than reflecting it off a screen, these devices aren’t affected by ambient light. On the downside, these panels are made of glass so they can catch stray reflections if not properly angled. While HD and 4K resolutions are only starting to filter into projectors, it’s old hat for displays. In fact, display makers are working on 8K screens. 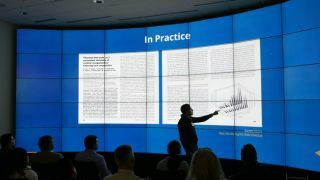 Big screens often provide interaction that’s done with either a display’s digital markers or with fingers. Some can handle working with as many as 20 inputs that can help create a group collaborative dynamic for things like solving a difficult calculus problem or troubleshooting an app’s code. By contrast, even the best interactive projector suffers from shadows that can obscure a vital part of the image. One place where large displays rule is in the hallway, parking lot or theater entrance as digital signage. The best can run for 24/7, delivering bright and detailed images that are sent over the school’s network to the screen. But, in an emergency, the display can not only alert students, teachers and guests that they need to evacuate, but can be set up to show the best route out. The biggest stumbling block for large flat screens at colleges is that they’re expensive. A 60-inch interactive display can easily cost twice what a good quality projector with the same resolution goes for.